You are here: Home / Blog / Archives / War– What Is It Good For? War– What Is It Good For? One by one, members of the small crowd on a hilltop at Arlington National Cemetery approached the man who had beaten all the odds. Some saluted him. Others shook his hand, had their pictures taken with him or patted him on the back, as if touching one of the last surviving veterans of World War I would be like touching history itself. Frank W. Buckles, 106, knows the feeling. 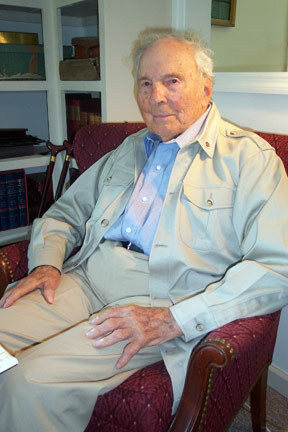 Having lived through the Great War and imprisonment in a Japanese camp in the Philippines during World War II, Buckles said his most vivid memory from those years was meeting Gen. John J. “Blackjack” Pershing after World War I. Yesterday, Buckles’s service was honored in a Veterans Day ceremony to remember Pershing, who commanded U.S. forces in World War I. The ceremony at Pershing’s grave, organized by the Military Order of the World Wars, was one of several in the area as crowds converged on the Vietnam Veterans Memorial and smaller groups gathered at various statues and memorials. Thanks go to Mr. Buckles not only for his years of service to our country, but also for sharing his stories with other generations. Today’s young people could learn so much from not only his experiences in France, Germany and as a prisononer-of-war, but also from his patriotism. I read the other day that many young men lied about their age in order to enlist in WWII. Some were as young as 14 years old. Imagine! What a different world it was. It would be interesting to know what Mr. Buckles would bring back from the 1920s, if he could….and what he would not give up from today’s world.